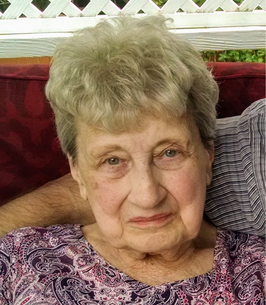 Beverly J. Draggett (Ball), 88, of Fredonia, N.Y., passed away peacefully Sunday November 18, 2018 at Elderwood Nursing Home in Hamburg, N.Y. She was born in Dunkirk on February 11, 1930 to the late William F. Ball and Maxine (Briggs) Stanley. Besides her parents, Beverly is predeceased by her husband of 64 years, Robert L. Draggett, who died July 2, 2014 and her step-mother Sylvia Ball. Beverly is survived by her children: Deborah (Robert) Magan, of Morrow, OH., Roberta Draggett Traks of Fredonia, N.Y., Carol (David) Bouquin, of Rochester, N.Y., Sharon (William) Winder of Dunkirk, N.Y., Barbara Draggett of Spencerport, N.Y., and Christopher Draggett of Rochester, N.Y.; 13 grandchildren, 11 great- grandchildren; two brothers: William (Albiene) Ball of Murrieta, CA., and Martin (Jane) Ball of Dunkirk, N.Y., and a sister, Patricia (Donald) Reed of Erie, PA.; Besides her husband, parents and step-mother, Beverly is preceded in death by her sister Harlene Ball and grandson Matthew Traks. Beverly worked as a telephone operator and retired after 25 years with Bell Atlantic-Verizon. She also volunteered with the Literacy Volunteers of America. She was an avid reader. Beverly enjoyed baking, cooking family dinners and taking family vacations. She also enjoyed sewing, gardening and sports, especially the Buffalo Bills. While a resident of Fredonia Place, she enjoyed participating in a bible study group. Beverly was a supporter of her children’s many activities, especially Scouting and the Parent-Teacher Association at St. Joseph School. She was a member of St. Joseph Church of Fredonia, and St. Elizabeth Ann Seton Church in Dunkirk. Above all, she was a wonderful mother who put her family above all else. Beverly was a kind, caring person and devoted mother who will be dearly missed by all. Funeral services will be private. Flowers gratefully declined. Memorial contributions may be made to Darwin R. Barker Library, 7 Day Street, Fredonia, N.Y., 14063 or St. Jude Children’s Research Hospital, P.O. Box 1000, Dept. 142, Memphis, TN., 38148-0142 or stjude.org. On-line condolences may be made at larsontimkofuneralhome.com. Arrangements by David J. Dengler, LARSON-TIMKO Funeral Home. To send flowers to the family of Beverly J. Draggett (Ball), please visit our Heartfelt Sympathies Store. Funeral serivces will be private.